This tutorial provides a general overview of how the invitation manager works and includes useful tips for how to manage your events. Create an event and include all applicable information by looking at each option available. You can always adjust the information later if you change your mind as to what to include. Send an invitation eCard by creating an eCard as usual and then on the edit message screen, click on the menu for "Include Event RSVP." Select an event and then send the invitation to yourself to make sure everything looks the way you want it to. Respond to your event as if you were one of the guests. Did you provide enough detail? Go to your invitation responses and remove your response. Copy the eCard you sent to yourself, make any desired edits and then sent the invitation eCard to your guest list. The Invitation List keeps track of who you invited. No matter how many different invitation eCards you send, you will see all of the people you invited in the Invitation List for your event. When the people you have invited view the eCard or respond to the invitation, you will see this in your Invitation List. Even if you delete the invitation eCard, you will still see whether they viewed your invitation or responded. When people respond to your event, you will see the information they provided in real-time in the 'Responses' for that event. If you delete a person's response, the invitation list will now show that the person has not responded, but they will still appear in your invitation list. 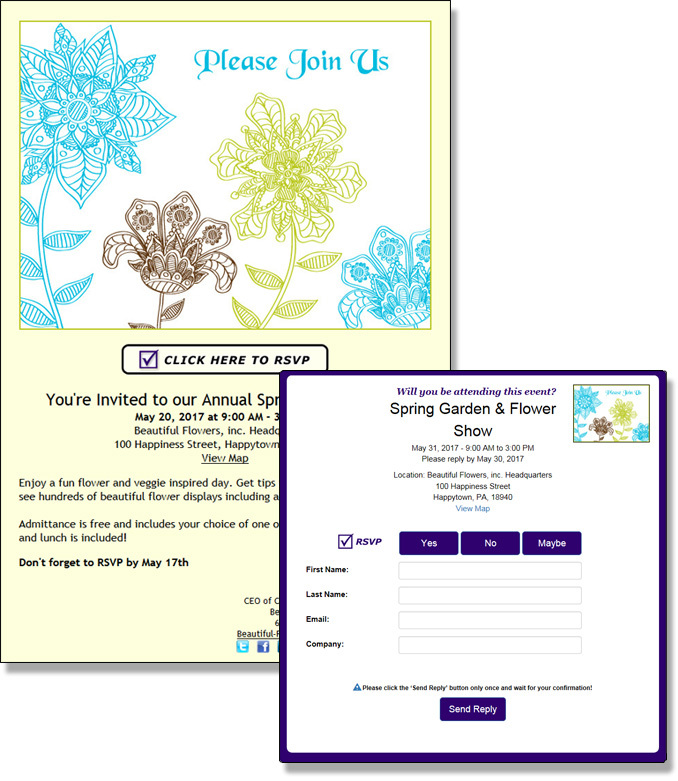 If you send a QuickSend Invitation, the recipient will be added to your consolidated invitation list for your event. You can combine an Event and an Online Survey in the same eCard. There will be two links in the eCard - one for the event response form and one for the survey response form. This is helpful if you need to ask your guests more than two questions. When sending a follow up eCard from the invitation list to those that did not pick up the eCard or to those that did not respond, an eCard is created for you with all of the appropriate recipients. You can then edit the eCard or invitation as usual. If a person on your invitation list has unsubscribed, then you will not be able to send a follow up eCard to this person. When sending a follow up eCard from the manage responses page, an eCard is created for you with all of the appropriate recipients. You can then edit the eCard or invitation as usual. When you delete an event, the associated invitation list and guest responses are permanently deleted.